Some days I wake up dreading the day. I get to do the same things I do every day. I try to juggle household chores and teaching and parenting and hope that I get a few minutes to sit down throughout the day. But I shouldn’t dread my days. Instead, I should find delight in the privilege of teaching my kids on a daily basis. Homeschool can be so fun. We can create art projects and we can enjoy hands-on learning. We can learn the ways that suit us and we can learn through play. I have the opportunity to teach my children that learning can be fun so they will not be brainwashed into thinking that learning can only happen at a desk or within 4 walls. Our potential is endless and our opportunities are boundless. Sometimes I forget that this process can simply be enjoyed. It’s fun and I can delight in finding fun in the little moments. Is there anything more exciting than watching your child start reading or finally master a math problem? It is so satisfying to watch them make connections and start to understand how things work. I can take delight that I am the one introducing them to the great pyramids of Egypt or the concept of telling time or the wonder of outer space. Ohh, and I get to learn along with them. I have learned more in my short time homeschooling my children than I ever did in school. How awesome that I can explore with them! I want our kids to learn about Christ from us. I want them to learn our faith, our standards, and our morals. I want them to understand what it means to have ethics and to exhibit character. I have the privilege of weaving those topics into our daily lessons. I can delight in being able to model character to them and pointing them to Christ throughout the day. And even when we have difficult days that are filled with arguing, fighting, disobedience, and discontent, I find object lessons for teaching character. In those moments I can pull out Scripture and show them where we’ve fallen short and I can remind them of the grace that covers us. I delight in the experience of discovering Scripture and applying it as we go throughout our days. One of the things I love most about homeschooling is the wonderful family time. There’s nothing sweeter than seeing all my kids curled on the couch together with their blankets as we listen to a read aloud. Or watching them all crowd around our little art table at art time as they share brushes and paints. I get to see my kids throughout the day and simply be with them. I don’t have to hurry them here and there and miss the small moments of chatting in the bean bag chairs or making a fort of blankets and pillows. My kids are best friends and I can delight in fostering those relationships while building my own relationship with each of them. I couldn't agree more. I delight in the relationship I have with my daughter. I would not have that close relationship if she was attending school away from home every day. "Our potential is endless and our opportunities are boundless." What a great way to look at it. Its so true. Sometimes I get caught up in all my to-dos that the fun kind of gets pushed aside. I have been trying to stay focused on finding the beauty in the every day. 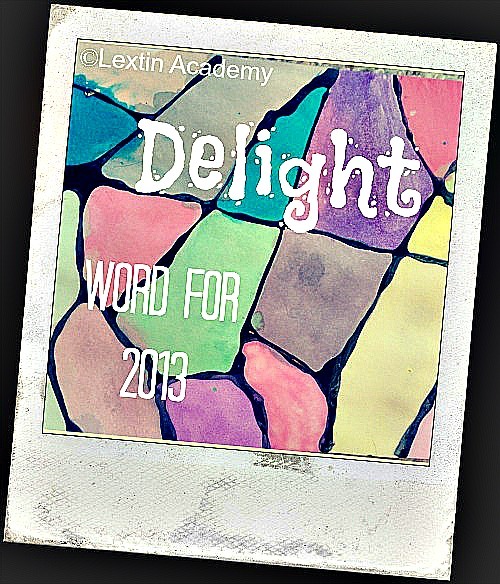 Delight is something I think we busy moms often forget to look for. Thanks for the reminder, Lexi! Delight is one of my favorite words. So proud of you for blogging about your word of the year. I need to do "create" some time to write about mine as well!